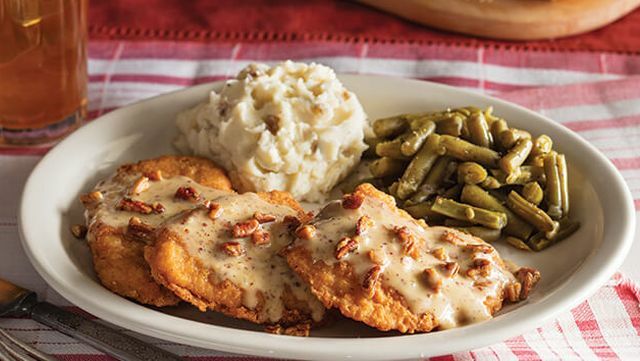 Cracker Barrel rolls out their seasonal fall menu for 2017 featuring dishes like Maple Pecan Fried Chicken and Pumpkin Custard. - Maple Pecan Fried Chicken - Three pieces of fried chicken covered with a maple mustard sauce and savory southern pecan topping. Also included is a choice of two country sides, made-from-scratch buttermilk biscuits or corn muffins, and butter. - Maple Pepper Bacon Breakfast Sandwich - Maple pepper bacon, a slice of sugar-cured ham, two fried eggs, sliced tomato, lettuce, and Colby cheese on sourdough bread. Served with a choice of fried apples or hash brown casserole. - Prime Rib French Dip Sandwich - Slow-roasted prime rib served with grilled onions, au jus, Swiss cheese, and peppercorn horseradish sauce on a toasted hoagie bun. On the side, there's a choice of home-style fries or a cup of soup, plus coleslaw. - Pumpkin Custard 'n Gingersnaps - Pumpkin custard topped with gingersnap crumble, whipped cream, and a fresh-baked gingersnap cookie. - Pumpkin Spice Pancake Breakfast - Three Pumpkin Spice Pancakes topped with whipped cream and cinnamon powdered sugar. The meal also includes warm syrup, two eggs cooked to order, and a choice of smoked sausage patties, thick-sliced bacon, or turkey sausage. 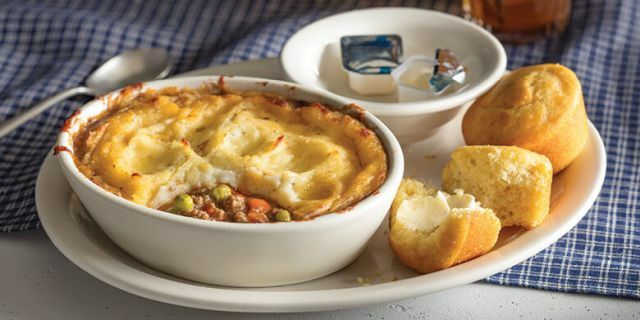 - Shepherd's Pie - Ground beef, peas, carrots, onions, and celery in seasoned sauce, topped with mashed potatoes and baked. Made-from-scratch buttermilk biscuits or corn muffins and butter come on the side.